The Truth window part number 20810, 30841, 30842, 31538, 31539, 30472 and 30470 are numbers we find on the Truth Entrygard window operators. These numbers are just stamping numbers, but they all point to the Truth Entrygard Operator 20810. If you have simialar numbers, or are still not sure, enter a comment below and we will get back to you as soon as we can. I have 3 Entry Guard windows that need new operators. The Arm has 31538 on it. 2 of the windows open to the left and one to the right. Can you please give me some advice on what parts to order? I also need pricing. The number 31538 is found on at least 5 different Truth Entrygard Operators. Do you have an number like 20810, 20755, 20544, or 20748 stamped on the linkage arm? The linkage arm is the arm that attaches to the bracket on the hinge side of the window. If you do not find a number you can email me a picture of the operator with the window open so I can see the arms and how they attach to the window. You can do this at https://www.homewindowrepair.com/contact-us . I’m Looking for a replacement for a Truth single arm operator. I don’t know the window brand. The unit has L30841 stamped on the arm, the length of the arm is 4 7/16″. One gear has 30843L on it, and an arm that connects to a slide on the bottom of the window to the window sill has 30744 stamped on it. The window does not hinge on the corner, rather slides as you crank open. Can you tell me the replacement part please? 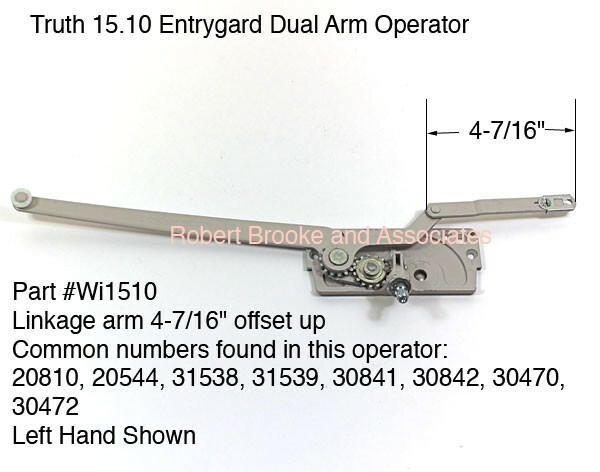 It looks like your part # Wi1510, but the Wi1510 has two arms, and my unit only has one arm. The track on the sill has 30751 stamped on it. I have pictures of all this, but don’t see a place on this site to post them. My guess is you have the older version of the Truth Entrygard Dyad Operator. The Dyad operator is the same as the Dual Arm operator, except for the longer arms (10″ arm). Just to make sure, can you send me a picture to sales@robertbrooke.com ? The number 30744 is a number we find stamped on the hinges, you would find this number on the top and bottom hinge. The number 30751 is also a number we find on window hinges. Thanks for the follow up. I just emailed you the pictures I took. Any help in finding a replacement is greatly appreciated. How do I remove the small arm (31538) of my dual arm window crank? You do not have to remove the arm 31538 from the window operator. What you will have to do is remove the complete window operator from the window. To remove your old operator, you can follow the instructions in a previous post from July 19, 2012, https://www.rbahelp.com/removing-and-installing-truth-and-truth-entrygard-window-operators/. I am looking to replace a part to replace, I have the parts 31538, 20755 and the part that needs replacing is stamped 45179. I can open my window but cannot close it because the knob comes loose when I try to close the window. I cannot find that part 45179. My guess is you need the Truth Entrygard Operator 20755. The numbers we find on these operators are just stamping and casting numbers, which lead us to make educated guesses on what you have. The stamping number help the most, they start with the number 2 or 3, the numbers that start with 4 are casting numbers, and they are usually no help. What has happened with your operator is the worm gear has popped. When you crank the window open the gear pushes down and is held in place. When you go to open the window, the gear tries to move outward, because you do not have the mechanical leverage. I need a replacement Truth Entryguard operator. On one arm is 20810 and on another arm is R30842. Please let me know what I need to order for a replacement right hand operator. . The link is 4″ instead of 4 7/16″. I have a window from 1987 that needs 2 new window cranks. The part number 30842R is just a stamping number, but it does narrow it down to about 5 different operators. 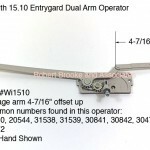 They are shown here: Truth Entrygard 30842R Window Operator . The only difference in these 5 operators is the linkage arm, which measure 2-7/8″, 3-3/4″ and 4-7/16″. The other difference is the offset, which would be offset up or offset down, this page helps with that: Truth Entrygard Dual Arm Operator Information . You might also find a number 20810, 20544, 20748 or 20755, that number will tell us which one you have. Hi, I need to replace the bottom hinge of my vinyl window. The hinge was stamped and states its a Truth 30751 B. The length of the hinge is 10 inches long and has three drill screw holes along the bottom. What replacement part can I use? Hi, I need a set of Left and Right casement window operators for Truth hardware. Windows are Kolbe and Kolbe (K&K). I believe they are Dual Arm operators based on a catalog of parts. They have stampings of 20810 on link (link offset up I believe, which is about 4.5″, long arm is stamped LH 30470 and is about 9.5″ long, there is a stamping 40471 and the short angled arm is L30841. Catalogs show these I think as TH 23076 and TH 23077. Can you please advise and Thanks Robert! I need to replace the mechanism of a window 30842r with arm # 20810. Other # on the push arm RH30472. Hi have a 30842R stamped on the arm of my window operator. The arm measures 9 and 1/4″ There is only one arm coming out of the operator. It is stampled truth. Can you help? The numbers that really help us the numbers that start with the number 2, so something like 20810, 20755, 20748 or 20544. I have 20 year old windows that require new openers. The stamp is Entry gard Truth 31538 L. The base portion is stamped with 45179. Can you please advise what I need to order? Thanks.